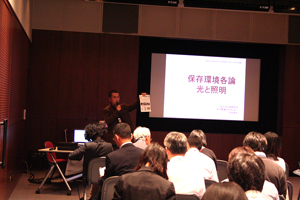 The 16th Local Workshop on Materials Conservation was held on Nov. 16th and 17th at the Contemporary Art Museum, Kumamoto The workshop had 68 attendees. The workshop seeks to send Institute personnel into local communities to teach basic knowledge about materials conservation to curators and administrators of cultural heritage. Seminars are conducted on topics such as general theory, temperature and humidity, lighting, climate control, and pest control. In addition, this session of the workshop was the first to feature a lecture on materials conservation in a “contemporary art museum.” Contemporary art museums are often designed based on concepts unlike those used in facilities dealing with works prior to the modern era. That said, contemporary art museums sometimes handle classical works, including national treasures , so persons in charge of cultural properties need to be aware of the characteristics of their individual facilities in order to safely conserve and exhibit those pieces. Such persons also need to handle those pieces appropriately. In addition, such persons are aware that the time has come for them to seriously consider the conservation of contemporary artworks with potential historical and artistic value. The fact is that we as curators are lacking in experience with and study of both works of contemporary art and the facilities curating them. Thus, the Institute hopes to actively ascertain the needs of current curators and highlight those issues.